Our company specializes in manufacturing and supplying Fetal Doppler, which is a medical accessory. We manufacture a wide range of diagnostic and surgical tools to cater the extensive requirements of Private and public clinics. 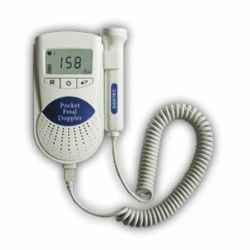 A Doppler fetal monitor is widely used to check the heart beat of the patients. This appliance measure heart beat rates of the individuals with the help of stethoscope. Our diagnostic instruments are appreciated by the surgeons and doctors for the features like light weight, precision measurement and manual operation. Looking for Health Enhancement Products ?